Editors: Ganong, Lawrence H. and Coleman, Marilyn J. 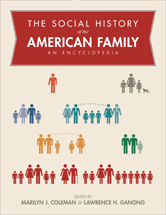 The four volumes of The Social History of the American Family explore the vital role of the family as the fundamental social unit across the span of American history. 1834: Should Females Be Employed in Cookery? 1916: Are Children's Parents Their Worst Enemies? 1919: What Is a “Good Wife”? 1922: Can Science Determine Your Baby's Career Before It Can Talk? 1986: Children's Defense Fund Report—Adolescent Pregnancy: Whose Problem Is It?